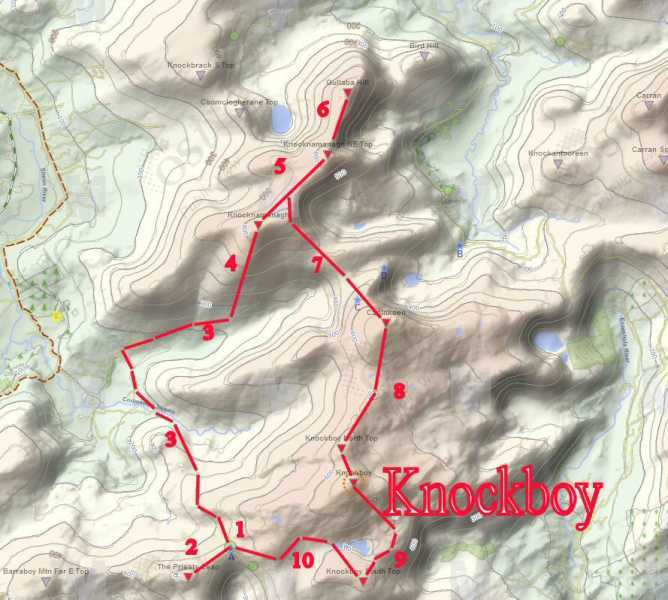 Here's a possible Knockboy route for the pursuer of the V-Lynams, Arderins and County Tops Lists. I'd be very interested to hear feedback from those with experience of the area. 1. Park at the col between Priest's Leap and Knockboy. 2. Ascend Priest's Leap and return to car. 3. Free wheel your bike NNW to Drehideighteragh and turn WNW and push the bike as far as you want, and hide it.. 4. Ascend Knocknamanagh, . 5. On to Knocknamanagh NE Top leaving your rucksack in the col. 6. On to Gullaba Hill. 7. Return to collect rucksack and descend SW to Caoinkeen. 8. Head South to Knockboy. 9. Descend to Knockboy South Top. 10. Return to car. This route would appear to comprise seven V-Lynams, of which five are also Arderins, and one, of course, is County Top of Cork, as well as being in the Highest 100. What do you think?